Create the perfect outdoor oasis with a shady patio to protect your family from the elements. At Pacific Home & Patio, our specialty as an outdoor remodeling company is installing patio covers to suit your lifestyle needs. 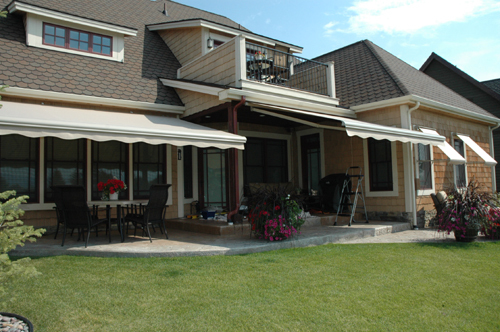 We offer retractable and fixed fabric awnings, and solid or lattice patio covers. Our retractable, self-storing fabric patio covers offer protection from the Idaho weather and are easy to care for. They have tough, spring-loaded folding arms that extend without the need for supporting posts. You can also set the pitch and angle to your specifications, as well as choose from over 200 colors and patterns. Retractable fabric awnings offer flexibility and ease of control, requiring the simple touch of a button. The newest versions of retractable awnings include sun and wind sensors. When the sun comes out, so does the retractable awning. This protects you from scorching sunlight and reduces your heating and cooling bills. When a gust of wind blows, the awning retracts, protecting your investment from the damaging wind and rain. We know busy families don’t always have the time to make sure an awning is safe from inclement weather, so our motorized awnings offer you peace of mind. For a more permanent set-up, you can choose a fixed fabric patio cover. A high-quality fabric patio cover is designed to slope downward, drawing rain away from the patio. This unique frame and patented method of securing the fabric to the frame allows you to put the cover on in the spring and easily remove it in the fall. The frame is coated with a powder that will ensure that the cover will last for years to come and cleaning is a breeze. Fabric patio covers reduce UV glare and excessive heat build-up, which improves your family lifestyle, increases your family’s savings, and enhances the look of your outdoor paradise. Whether you choose a fixed or retractable awning depends on your lifestyle and vision for your home, but either one will really enhance your family’s outdoor remodeling project. If you would like more information about our fabric patio awnings or would like to request a free quote, contact Pacific Home & Patio at (208) 376-0000. Pacific Home and Patio is Boise’s choice for patio covers, sunrooms, commercial and residential awnings including retractable awnings, pergolas, screenrooms and shade screens – contact us today for a free estimate.